SKASOL representatives visit client sites regularly to test current water quality and audit the program performance in general. A complete account of the work is documented in our ChemTrakTM database. A clear and concise Technical Service Report is generated as the client’s permanent record of the work. This report is verbally presented to the client contact on location to ensure clear communication with respect to the findings. We pride ourselves in being extremely hands on. Any adjustments, calibrations or repairs that may be required are completed during the service visit whenever possible. Our field reps are fully trained in making mechanical repairs on all makes and models of water conditioning equipment as well as chemical feed and control equipment. They carry a complete tool set along with common replacement parts. After the service visit, SKASOL continues to use ChemTrakTM field data to provide even more supplier value. 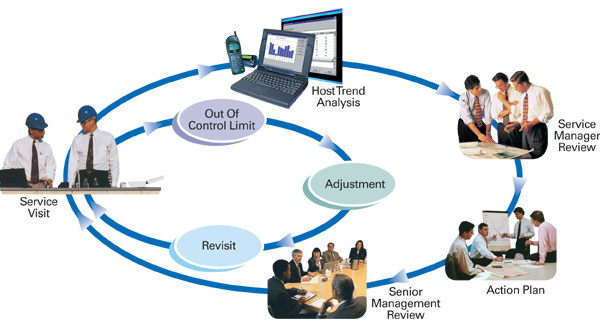 Using statistical process control concepts, we monitor trends within all of our customer systems to highlight specific areas that require management attention. We aim to achieve unmatched program performance though excellence in water management. SKASOL Technical Representatives are available for emergency service 24 hours per day, seven days per week, 365 days per year. Through our toll free telephone number and response system, we dispatch the required level of expertise to match the urgency of the situation. Our comprehensive in-stock parts inventory will ensure that repairs are completed in a timely manner. SKASOL also maintains a comprehensive collection of “loaner” equipment that can provide immediate service in the event that field repair is not possible. Effective water management is possible only when all program participants clearly understand the technical and business concepts relating to their area of responsibility. If required, we ensure that each client contact is given the necessary background information and sufficient technical detail in order to accomplish treatment objectives. In all cases, our standard account start-up procedures will produce specific operating manuals, control charts and logbooks. Orientation and training seminars are conducted at your facility to ensure that all of your staff has a complete program overview. Visual inspection of critical system components is vital in monitoring program performance. Our Technical Representatives inspect and document the condition of components during pre-planned inspection opportunities. Written reports and photographs are added to our ChemTrakTM database to service as a permanent record of the inspection. When required, specialty services such as boroscope techniques and fiber optic camera and robotic technology are available to inspect difficult to reach locations. SKASOL is also affiliated with many leading industry experts who can provide third party inspections or specialty non destructive tests. SKASOL’s experience with thousands of client systems can be put to good use when you are planning a project or evaluating the feasibility of an alternative treatment technology. SKASOL will provide expertise from concept to commissioning. In the case of new applications, SKASOL engineers predict the best combination of equipment and chemistry to result in a true least cost operating scenario. For existing applications, SKASOL can often reduce operating costs by applying modern proven technologies. Documented case studies, references and return on investment calculations are always supplied to validate our proposals. Advanced analytical services can provide important scientific information to ensure that proper corrective action is taken in solving water treatment related problems. To complement the capabilities of our own laboratory, SKASOL is associated with many specialized consultants in the areas of failure analysis, metallurgical and deposit analysis, microbiology and health and safety.